Lately I’ve been feeling a little home-sick for Finland and nostalgic for childhood summers spent frolicking on fields and swimming in lakes. 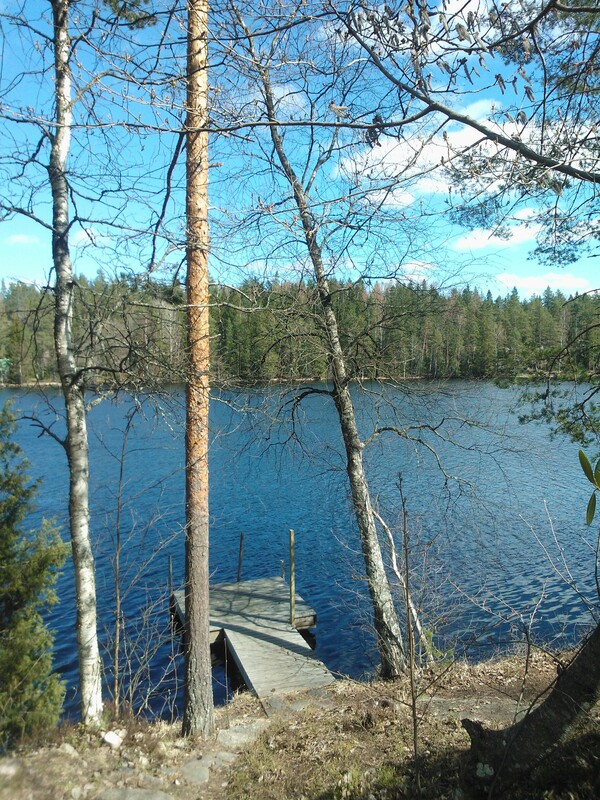 Ignoring the part where a large proportion of my childhood summer holidays were spent sitting under the shade reading, I did genuinely have a great time at my grandparents’ summer cottage in Jaala. In my late teens it was also a welcome break from my part-time job behind the beauty counter. There are a few products and brands I remember very fondly from Finland. Even now, in the big wide world, surrounded by all the choice of an over-saturated cosmetics market (or perhaps because of it), I get a lot of joy and comfort from using some things from way back when. I’ve gathered a little selection of products that I use or stock up on when in Finland. 1. My grandmother’s favourite hand cream – Lemon Juice & Glycerine (and that’s pretty much all there is to the formula). It’s inexpensive, widely available in Finnish supermarkets, smells delicious and a little goes a long way. My gran had not just a green thumb but ten green fingers. Her cottage garden was magnificent. She would use this cream after a day’s hard work outdoors and her hands were always soft. 2. Berner’s XZ-shampoos and conditioners are some of the best mass-market products you can get for your hair. The formulas are decent, as are the scents and if I forget to pack shampoo when I travel to Finland (as I did last time), this is the brand I look out for at the supermarket or chemist. I’ve tried a few of them now; the sea buckthorn range was a particular favourite. 3. When did I start using these? Late 80s, I think. The Deborah Hydracolor tinted lip balms are probably my favourite tinted lip balms, ever. I did stop using them when I came to the UK (as they don’t seem to be available here) but I bought four different shades on our last trip to Finland and they are all lovely. The flavour alone takes me back. 4. Louis Widmer, how do I love thee? There’s an interesting element to the Finnish cosmetics market. The Boots-type pharmacy/drugstore doesn’t exist; instead you have very sterile and serious pharmacies in which you can find a (growing) selection of (usually quite) earnest cosmetics. Hypo-allergenic, cosmeseutical; as long as it could be marketed by a man in a white lab coat, it gets in. 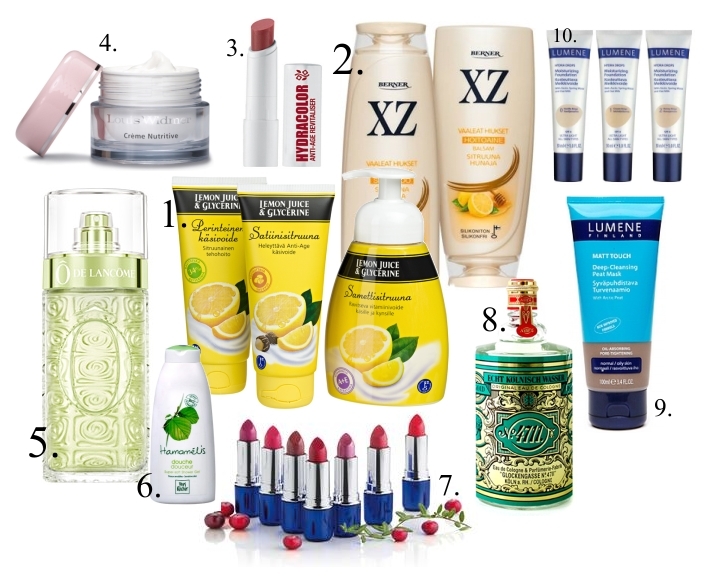 The self-selection drugstore cosmetics are found in supermarkets, department stores, Anttila stores and standalone cosmetic stores (of which there are now many, many more than 20 years ago).The Swiss Louis Widmer brand has been a staple in Finnish pharmacies for decades. I first tried the products when I was working in one of the first standalone cosmetic stores in Finland and on my last few trips back I’ve been stocking up on the eye cream and vitalising night cream; the textures are rich and soothing (I use them in winter or at night if my skin feels very dry) and the scent is Nivea-like, comforting and old-fashioned. 5.Ô de Lancôme was one of my go-to summer scents 20 years ago. I first learned of it when working in that cosmetics store and I fell hard for that 70s-style cologne and for Givenchy III, a bitter citrus chypre that I couldn’t get enough of. If you think these are odd choices for a teen, it may be comforting to know I also adored Balahe (an oriental spicebomb with a boozy vanilla and eugenol accord), Jardins de Bagatelle (a sugary tuberose garden writ large which could give today’s fruity florals a run for their money) and even Elizabeth Arden’s Red Door. Ô de Lancôme was a great summer scent, though, and smelling it now takes me back to those days. 6. Yves Rocher was and still is popular in Finland. I mentioned the Chevrefeuille products I’ve been using recently and the Hamamelis-range is something we always seemed to have in our bathroom when I was growing up. 7. I wonder if there is a single Finnish cosmetics-using female who doesn’t own at least one Lumene product? A home-grown brand owned and manufactured by a pharmaceutical company, Lumene caters for the needs of Nordic women and uses some interesting local materials from arctic berries to peat. I’ve never visited Finland without buying at least one Lumene lipstick. There are many really flattering shades for pale complexions and the formulas are easy to wear – they don’t tend to feel heavy, drying or sticky. 8. 4711 was one of my gran’s staples along with the lemon hand cream and a touch of face powder. The cologne was more of a summer cottage thing; in town she preferred Arden’s Blue Grass. The smell of 4711 is very nostalgic; I love cologne, full stop – and it’s a great product to carry with you on summer travels. Something to rinse your hands with instead of alcohol gel, or to splash on after a shower. It’s nostalgic but still relevant. 9. I told you Lumene uses peat – here it is in all its glory; a deep-cleansing peat mask. I find this absolutely marvellous for my awkward ageing combination skin. I use this on my t-zone and buy two or three tubes to take home when I visit Finland. 10. Lumene Hydra Drops is a very lightweight foundation made with oatmilk and fluffy clouds. At least that’s how it feels on your skin. It’s one of the few liquid foundations that comes in a shade light enough for my winter skin and doesn’t settle into pores. I tend to prefer powder foundation overall, but when my skin is feeling dry, dehydrated or a bit cranky, this stuff is magic. Yes, absolutely! It’s one if the main reasons in-house perfumery schools for big manufacturers take in students from the countries they are planning to target. Lovely piece. I want to go an buy a bottle of 4711 now. It will also bring back all sorts of memories of my grandmothers!